And so it was that I discovered the photos of Dominick Gravel early Monday morning when I couldn’t sleep. I’d say I “wasted” two hours at his website and blog, because I should have been sleeping so I could be human for work in the morning, but I couldn’t stop. Mr. Gravel’s photos took me around the world and every one of them was more than art. Playing lot cricket in India, school girls in Japan, riding bicycles in Nepal, a smile from the Dalai Lama, speeding across the plains of Tanzania, an alleyway in Hong Kong, releasing a captured bear somewhere. Who is this guy? 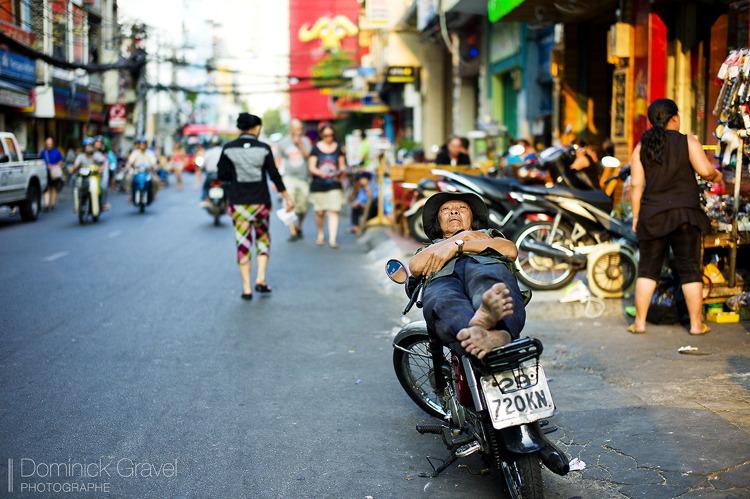 Last night I found that Mr. Gravel has posted many new and fabulous photos of Vietnam, Korea, Paris and Australia, and more people, people, people! Have a look at Dominick Gravel’s DKGphoto.com and his info website, but I warn you… be prepared to blow at least an hour. Well worth your time. With the breaking story that Tourism Minister Sealy took 135 Ministry employees to Guyana for a weekend “retreat”, we were reminded of this recent post by Adrian Loveridge. Sealy blew it on the optics alone. If he thinks that the public will support this “retreat” in Guyana, he’s out of his mind. Instead, he should have had groups of employees staying at hotels in Barbados and then getting together at the Hilton or other venues to discuss whatever it is they are going to discuss. As Adrian said in his original piece, he seldom sees anyone from the government at his place and he’s not alone. Unless Guyana’s tourism product is so much better than ours that the intent was to show everyone at the Ministry how things are supposed to be done? In which case, we are really in trouble. Back in the nineteen seventies, after working in Canada, I returned to the United Kingdom, taking two temporary non-travel related jobs to establish enhanced credibility for the purpose of obtaining a house mortgage. Both were important learning experiences which I have never regretted. The first was working as a salesman in a branch of a high-end consumer electronics retailer selling audio equipment products made by manufacturers that included Bang & Olufsen and Roberts. The manager instilled a valuable lesson that has stayed with me for life. His view was that if you are ever going to effectively sell anything, whatever it was, that you had better know everything possible about it. I think he sensed a genuine interest and allowed me to take, what at that time, were very expensive pieces of equipment home at night and weekends to familiarise myself with their features. Months when later I formed a tour operator company, this acquired wisdom formed an integral part of the business masterplan. Irrespective of the product or service, intimate knowledge of every aspect is critical, if you are going to fully understand your marketplace and prospective customer. Ricky Skerritt: Cruise ships leaving Caribbean for more profit. Tourists say that’s not the entire story. “The ships are going wherever they can get the best yield, which we understand, because the cost of flying to the Dominican Republic or Barbados is so much higher for European passengers, especially from Britain with Air Passenger Duty. Mr. Skerritt’s attempt to put some hope and an upbeat spin on the situation is understandable, but logic tells us that the decisions made by various cruise lines to abandon the Caribbean either for the summer or permanently will not be reversed anytime soon. Once again, logic tells us that once a ship leaves Barbados and the Caribbean on a permanent basis – it may be years before we see it or a replacement tie up a Bridgetown. An old friend alerted us to this story and also to the reaction on some of the cruising blogs and discussion forums. The reaction to Mr. Skerritt’s comments by experienced Caribbean cruise passengers from the UK is both revealing and disturbing. Barbados Tourism Authority’s Austin Husbands: Keep quiet about bad beaches, environmental damage. The tourist numbers are tanking – they have been tanking for a long time. Global financial problems are taking a toll, it’s true, but our numbers are especially bad and worse than most in the Caribbean. Many folks think that a little more advertising will take care of things. That might get us a few more tourists, but that won’t cure the foundational problems that we have with our tourism product. This article from our own Nevermind Kurt tells it fuh truth! We drove the old tourism economy taxi right into the ground without changing the oil or performing normal maintenance. We just made money with that old taxi until it could go no longer and we didn’t save for a new one. So here we are trying to make our living driving an old rust bucket of a taxi while everyone around us has a shiny new taxi. No contest where the customer will take their money! I’m no longer angry at Mr. Husbands. I think he’s wrong in his approach, but I understand where he’s coming from. I understand his generation’s current desperation and exasperation that while the BTA spends tens of millions of dollars advertising and promoting a Perfect Image of Barbados, concerned Bajans and disgruntled visitors are posting photos of the truth online. Has Mr. Husbands ever read TripAdvisor or Carnival Cruise Lines forums? He should… every day. Welcome to Barbados. Air Canada deliberately left your luggage at home. We’re used to hearing stories of lost and delayed luggage concerning LIAT Airlines (Leave Island Any Time), but we’ve never heard anything like the current news about Air Canada. A couple from Kelowana British Columbia on Canada’s Pacific Ocean coast flew all the way to Barbados only to discover that Air Canada DELIBERATELY didn’t load their luggage!!! Their luggage was left off the flight because the aircraft couldn’t hold any more. No one told the couple when they switched aircraft in Toronto, and they wasted several hours looking for the bags before boarding their flight to Barbados. The bags were not overweight or unusually sized: Air Canada “regularly” does this to customers, according to a Canadian CBC article. In this case the wife’s bag arrived two days later and the husband’s bag arrived four days later, probably just in time to head back from their week’s vacation in Barbados. 1/ You should always pack your carry-on with the expectation that the main bag won’t ever arrive in Barbados. 2/ You’re nothing but cattle to Air Canada. Get used to it! Cruise ship crisis in Barbados? What a terrible week for Barbados tourism. First it was Royal Caribbean announcing the removal of all its ships from the southern Caribbean during summer of 2012, then we heard that the Sea Princess won’t be here next winter. 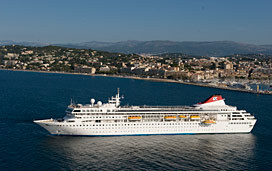 It’s being transferred to Australia under the P & O Australia brand. Today we just got news that Fred. Olsen Cruise Lines is leaving Barbados. The Braemar is a regular in Bridgetown and unloads 1000 passengers every time it pulls in, but it’s outta here after next winter. Unfortunately the cruise lines are citing fuel costs to get to Barbados because we’re at the end of the line compared other islands that are a little closer to Miami and to Europe too. So that’s not something under our control. What we can do though, is to make sure that every tourist that sets foot in Barbados has a positive experience, and especially so when they meet Bajans in the tourism industry and while out and about. A little smile and a friendly comment can go a long way to create a positive impression for all of us. Four time Guinness World Record holder Garry Sowerby writes about a trip to Barbados in today’s Las-Vegas Review-Journal and says that he and his wife came away from our island with “a head full of warm memories that will make us smile for a long time” thanks in part to an unknown Barbados Police Constable. I wish we knew that officer’s name because he deserves thanks from every one of us. Folks, we’re all in the tourist business on this rock and each one of us has to do their part. Remember that next time you see some lost soul trying to decipher a map or a road sign.